This bloodtrail is 100% real. All the pictures and steps are as it happened during a Kansas deer hunt in November, 2011. Good Luck! 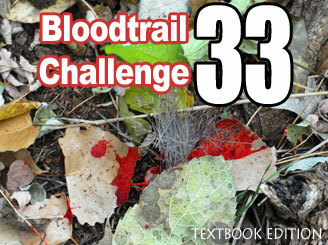 At the request of our visitors Bloodtrail Challenge 33 has been designated as a "Textbook" Edition. That means that that the answers are based on conventional wisdom surrounding the art of blood trailing. You still need to pay close attention to details as some questions contain subtle clues. Remember - these games are designed to be both educational and fun. When trailing we are always looking ahead to find the entire deer, not just blood. Sometimes it's obvious and sometimes it's not. Look at the photo above and see if you can spot the deer - assuming it's even in the photo?